The Cherry Blossom Shake from Shake Shack. Shake Shack has made a habit of keeping even its most ardent fans on their toes, and the burger-and-fries chain continued that tradition this week by bringing its cherry blossom shake to restaurants across the United States, including Philadelphia. The cherry blossom shake, which pays homage to Japan’s cherry blossom season and was originally available exclusively in Japan, is available now at both Center City Shake Shacks, along with the University City restaurant. The chain’s newest shake begins with vanilla frozen custard, which is blended with cherry blossom (extract, not the actual flower), and topped with pink-dyed white chocolate curls. In Japan, the shake was dubbed the “Shack-ura Shake” after “sakura”, the Japanese word for cherry blossom. According to LiveJapan.com, Tokyo’s blossoms started blooming on March 21, and the peak cherry blossom bloom is expected to happen sometime around March 29. It seems like Shake Shack did its research and rolled its newest item out at the perfect time. New York Magazine’s Grub Street tested the shake at a New York location on Tuesday and gave the chain credit for not over-saturating the pink color, but knocked some points off for what the site called “intense sweetness”. How long the shake will be around is unclear. The cherry blossom season reaches until May in Japan; whether the chain will keep it running throughout the season remains to be seen. What is clear, though, is if Shake Shack keeps the cherry blossom shake coming back around year after year, the McDonalds Shamrock Shake will finally have some friendly competition in the very specific March holiday-themed shake arena. 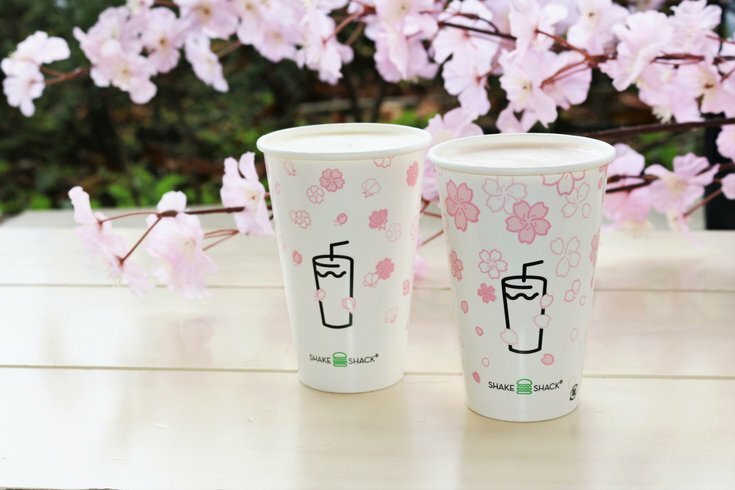 The cherry blossom shake will run you $5.79 at Shake Shack’s Philly locations.